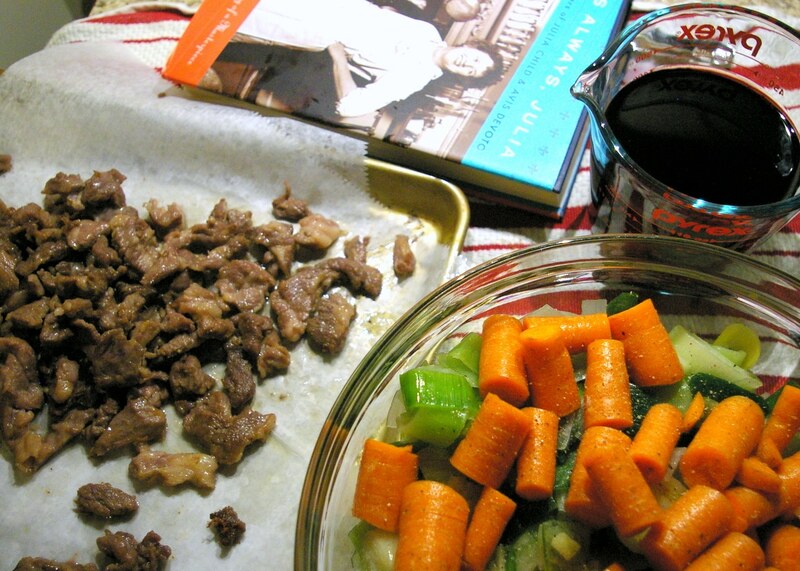 Julia Child had an amazing way with food, pushing the culinary envelope and social norms. 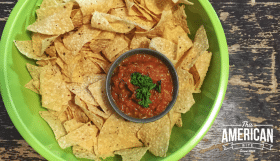 At a time when convenience foods were on the rise in North America, Julia passionately shared her love for real food from the streets of Paris and took a chance to teach the microwave generation how to keep eating well. Julia’s beef bourguignon is perhaps her flagship dish so I am using the very best ingredients. The beef stew, lamb bacon and stew meat I am using for my kosher beef bourguignon is all 100% organic, hormone free, grass-fed and from the good people at KOL Foods (click here for all my KOL Foods recipes). 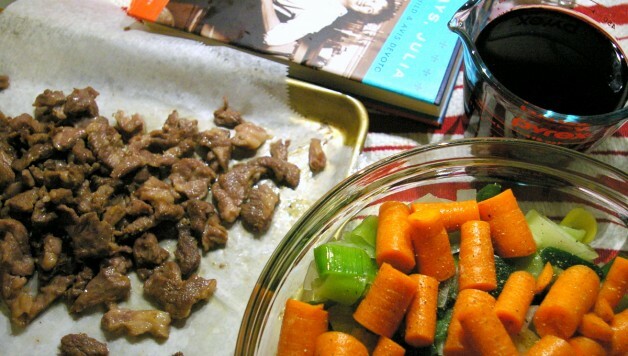 Julia would have turned 101 today, and in honor of her birthday, I am sharing a kosher beef bourguignon recipe, proving that you can have a delicious dinner without the butter. I feel like this really is a fitting tribute because of the many lessons Julia shared over the years, there is one that holds true to me more than any other. Never apologize for your food. If you are serving it, embrace it, enjoy it and love it. Wise words from a women that was the original celebrity chef. My kosher beef bourguignon is certainly not the way Julia served her dish, but it’s the way I did, and it really was a treat. If you have half an hour to watch the original PBS show, here it is. If not, save this page and take a moment to watch this brilliance another day. The more love you put into a dish, the more complex the flavors will be, so set aside the time, and the best ingredients, and make this for a special someone’s birthday. You are going to want to take care to fry the lamb bacon and sear the beef, and if you have a farmer’s market, pick out the freshest produce you can. Julia would have liked it that way. The KOL Foods beef, lamb and beef stock have a richer, truer, flavor than any other meat I cook with, just look at the color of this lamb bacon! 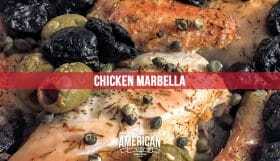 When you’re browning the meats, make sure you give them space to breathe, and because this recipe calls for a whole bottle of wine, you might want to open two bottles so that you can drink some while you cook some! 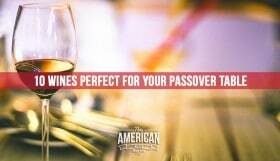 I used Atoona Hills Cab-Shiraz which I find is one of the best affordable bottles of kosher red wine. You are also going to find that the kitchen will come alive with smells and aromas as you sear each batch of lamb bacon and stew beef for that perfect first step of preparing this dish. Make sure to give your meat plenty of room in your dutch oven so that you don’t reduce the temperature of the oil or overcrowd the meat. 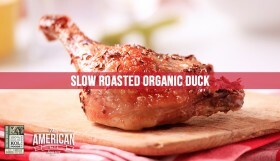 Heat your oil in the bottom of your dutch oven, dice the lamb bacon and once the oil is hot, fry it until cooked. Using a slotted spoon or a fish spatula remove the lamb bacon, leaving the fat and juices in the dutch oven. Set the lamb bacon aside on a cookie sheet and keep the dutch oven on the heat. 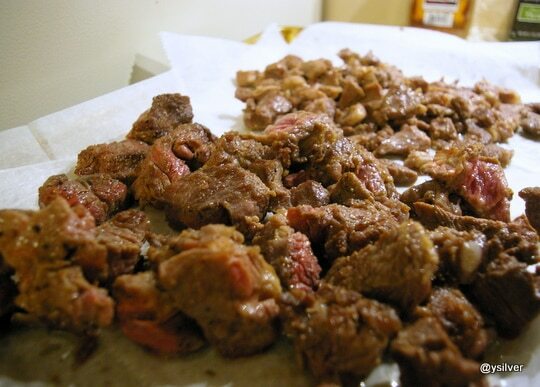 Dry each cube of stew meat with a (paper) towel. If you do not do this, you will not get a nice sear on the beef. 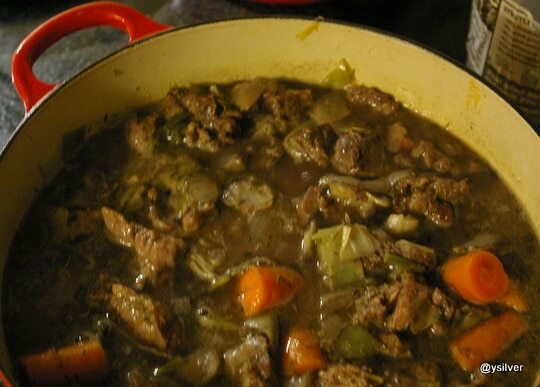 Sprinkle a little fresh-cracked black pepper on the beef and put into the hot dutch oven. Do not crowd the beef. I had to cook my stew beef on high for about three minutes, and I did so in three batches to make sure there was room for it to sear properly. 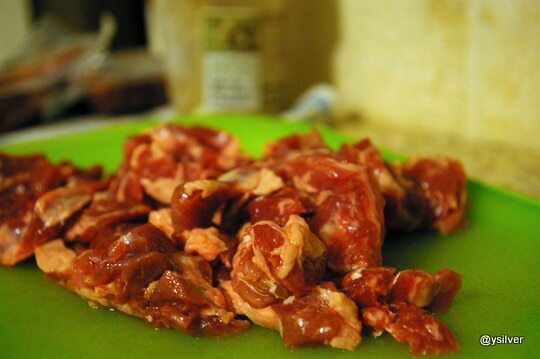 Set the beef to the side with your lamb bacon, using the same slotted spoon so not to lose any of the fat or juices. Put your carrots, onions and leeks in the dutch oven and allow them to cook down. They will cook down, give them about ten minutes on a medium heat. Add the garlic, cook for another minute then add the lamb bacon and beef. Mix, add three cups of red wine, then add beef stock so the meat is just about covered. Bring to a simmer, then put in your oven, pre-heated to 250 degrees, for at least two hours or until the beef is tender and soft. The beef will get tougher before it gets soft, so don’t worry too much. This dish is best made a day ahead. Re-heat at 250 degrees for about 90 minutes so the meat can continue to soften. Plan for leftovers, the flavors are rich and delicious on day three two!